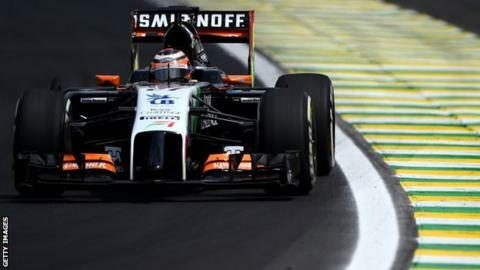 Force India have pulled out of the first pre-season test, which starts at Spain's Jerez track on Sunday. The team had said they would be unable to run their 2015 car at the four-day event but have now also cancelled plans to test new parts on last year's car. A spokesman said the decision was taken on "efficiency grounds" because of the "limited learning opportunities". He denied financial issues prompted the move and refused to comment on reports the team are late paying suppliers. "The decision was taken at the end of last week," the spokesman said, adding that the team would be at the second and third tests in Barcelona later next month. "We were planning to go there but we decided it was better to focus on Barcelona. When we weighed it all up, the best decision was not to go." Jerez is renowned as a track where it is difficult for teams to learn a great deal about their cars because it has a unique and particularly abrasive asphalt surface. With only a 2014 car to use, and the same engine supplier in Mercedes and the same driver line-up of Nico Hulkenberg and Sergio Perez, the prospect of learning a great deal at the test was slim. Force India were one of three smaller teams who complained towards the end of last season that Formula 1's revenue split made it hard for them to survive financially. They, Lotus and Sauber said the prize money was unfairly and disproportionately weighted towards the more successful teams. Force India deputy team principal Bob Fernley even claimed at one point that there was an agenda on behalf of commercial boss Bernie Ecclestone and the top teams to force the smaller teams out. Principals of the leading teams denied this. However, there has been no progress towards giving the small teams more income and F1's main shareholder CVC has, according to sources, told them it is not prepared to make any more funds available.